A Liberal's Libretto: Tosca, Zeffirelli and Weenies- oh MY! Tosca, Zeffirelli and Weenies- oh MY! 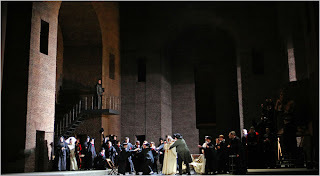 Last night, I had the ... uhm ... pleasure of watching the MET's controversial new Tosca, which was directed by Luc Bondy. I had DVR'd it because I knew that I would have to get up the courage to watch it, very much in the same way that someone summons the courage to battle. You see, Tosca is one of those shows that has a special place in my heart. Not only do I love the show, but when I sang Scarpia, it was the last production in which I had the opportunity to work with Francesco Pace. My Tosca, Kathleen Halm, was beyond compare dramatically and vocally, and the production - although very small scale - was really quite a joy. Watching my reactions as I viewed the MET's Tosca, you would have thought I was watching my favorite team lose the Superbowl - complete with the talking out loud to the television. I'm not going to lie to you, Friends. I don't have a favorite team and I don't watch football. But, how-in-the-hell else was I to get my point across? The choices that Bondy made in his direction, although fresh and new, were not ideal in the minds of purists as his directives had little to do with the music and libretto. Some may like the production and his choices - that is perfectly fine - but for me, not so much. Now, enter a NY Times article from yesterday - The Metropolitan Opera Weighs the Return of Zeffirelli’s Tosca. 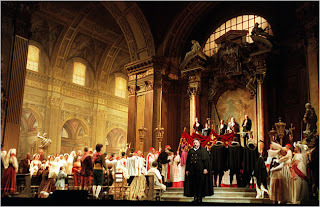 It seems that in order to make space for Wagner’s “Ring” cycle next season, the MET has been kicking around the idea of bringing back the Zeffirelli version of Tosca because it takes up less space backstage. The scheduling involves backstage space for the Met’s new production of Wagner’s “Ring” cycle that is being created by Robert Lepage, the Canadian director. The “Ring” set, because of its complexity, must remain fixed on one of the Met’s two lateral stage wagons — rolling platforms that are stored in the wings — for long periods. The Bondy Tosca set uses both lateral wagons, while the Zeffirelli production uses only one lateral wagon and the stage’s rear wagon. When asked why, then, the Met did not schedule an opera with a more compatible set, Mr. Gelb said it made sense to bring back Tosca because of the investment in rehearsal time. He acknowledged that the plan had been to retire the Zeffirelli Tosca but added that he had publicly stated that it would not be destroyed. Operatic staples like Tosca are important sources of income for many opera houses - the MET is no different. As the NY Times points out, the opera sold out this fall, and Mr. Gelb said that advance sales for the remaining performances this season were "strong". I say, whatever the reason, bring back the Zeffirelli version. Please?! Well, if wanting to see a production that is actually based on the music, libretto and composer's directives written in the score makes me a weenie - then, call me a Ball Park Frank and pass the mustard. Seriously though... the more this hooplah around Tosca continues, the better it is for all involved. Gelb, Bondy, Zeffirelli, the MET - all of them. You can't buy this kind of publicity.